This is what my Quilter's Planner looked like over the summer. This is what it looked like last week. It's not that there was nothing that needed to be done over the summer, but it was vacation time and I was very much in the "it'll get done when it gets done" mode. I could do a little here and a little there whenever I felt like it. Now, though, I'm babysitting four 1-3 year olds full time so my available time to do anything productive is rather limited. That means I have to schedule it in and actually make myself (try) to follow through on my plans. 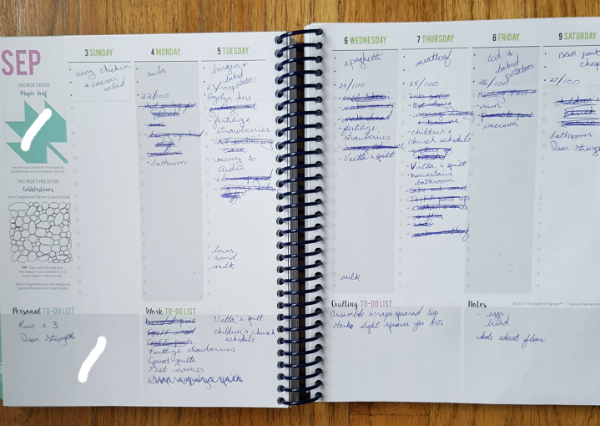 I have to admit, I don't always get everything done, but crossing things off feels really good 😊 And for some strange reason, I actually like seeing the column for each day filled with tasks, with all intentions of being super-productive. 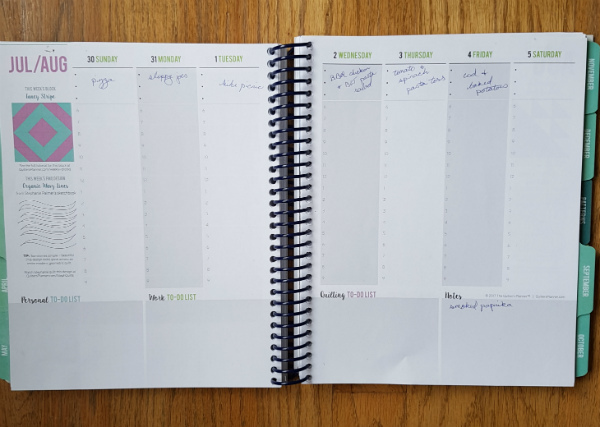 I may even be guilty of over-planning in my enthusiasm, writing down more things than I could possibly ever accomplish in the time I have available, as evidenced by the not-crossed-off things on last week's list. Then I wake up on Saturday morning and there's no water. So much for my plans to clean the bathroom, workout and then shower! Since I knew this would be today's devotion, I was rather amused by how the lack of water hijacked my plans for the day, while at the same time that I was annoyed because I couldn't get done what I wanted to. "Now listen, you who say, 'Today or tomorrow we will go to this or that city, spend a year there, carry on business and make money.' Why, you do not even know what will happen tomorrow. What is your life? You are a mist that appears for a little while and then vanishes. Instead, you ought to say, “If it is the Lord’s will, we will live and do this or that" (James 4:13-15). You do not even know what will happen tomorrow. How true is that? No matter how hard we wish it, we cannot see into the future to know if we will have the health to pursue the plans we're making, or if we'll still be living in the same place or if we'll still be alive then. We don't even know if our water will be flowing through our taps when we wake in the morning! If it is the Lord's will...My plans have a tendency to be all about my will. They reveal what I want to accomplish, where I want to be a year from now, the work that I want to be doing. Can you relate? I often have to remind myself to step back and ask if what I'm planning is God's will for me or not. Of course, this doesn't mean that we shouldn't make plans, either in the short-term or the long-term. It means that we try to remember that our plans are really in God's hands. 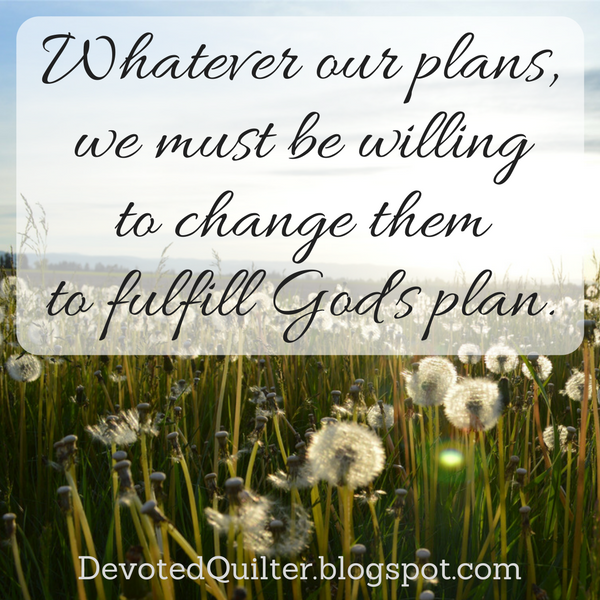 We acknowledge that His will must prevail and we must be ready and willing to adjust our plans to fulfill His plans. That's not always easy, especially if we're attached to our plans and dreams, but it is the best way to be sure that we are living the lives God has planned for us. And you can be sure His plan is the best one!